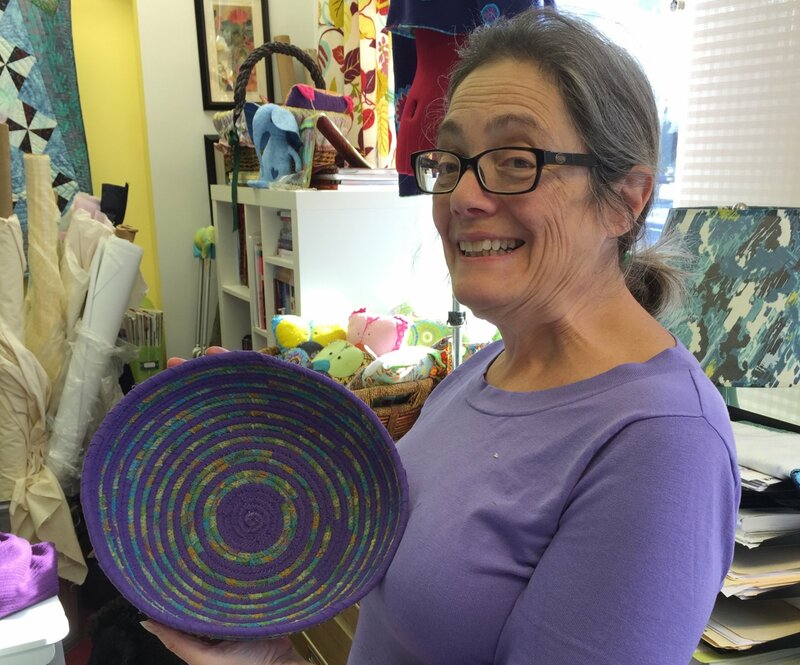 Netta has been making sewn pottery with clothesline wrapped in strips of fabric. A beautiful, Lotus decal, Singer sewing machine from the 1930's. 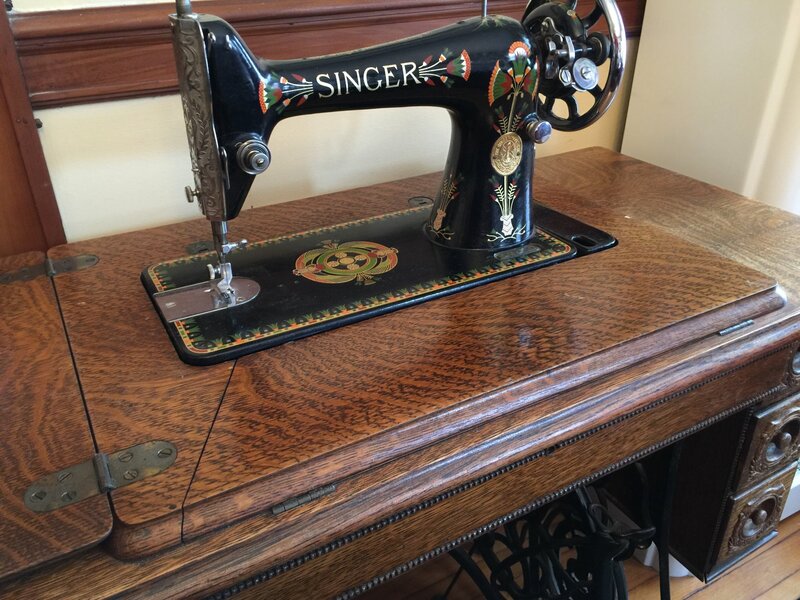 I was fortunate to buy this a few years ago, and recently found a beautiful treadle cabinet for this machine. Frances loves her new pillowcase. 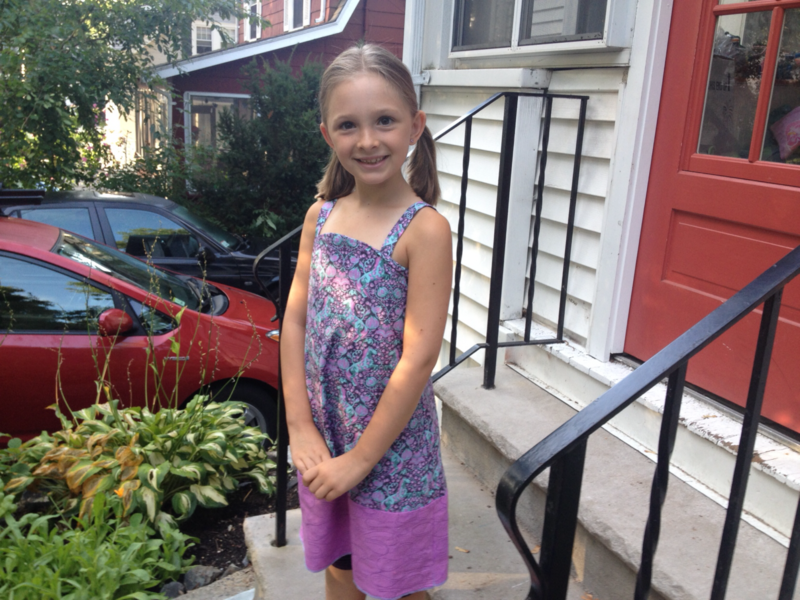 Aurora made her dress for the first day of school. I think she was only 7 years old at the time. She has an unusual talent. 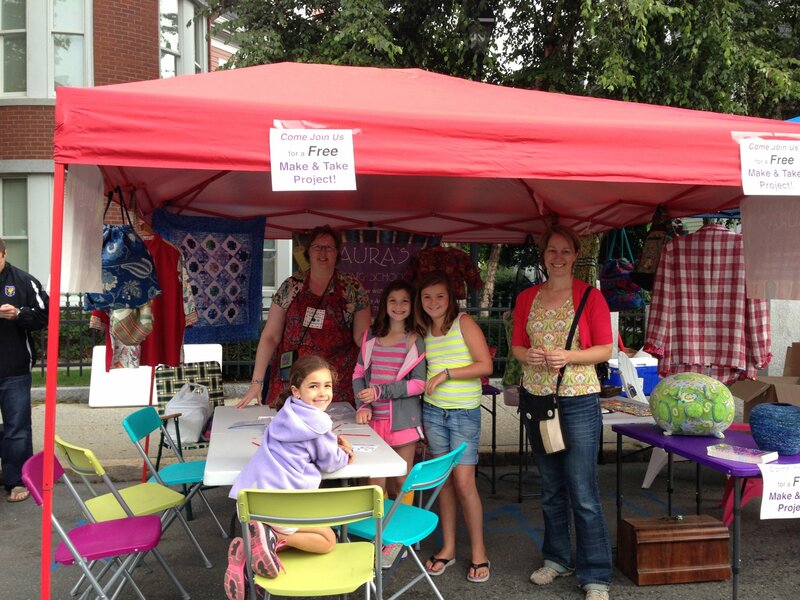 Laura's Sewing School both at Arlington Town Day. Sophia and her mustache pillow. All her own idea. We made the pattern together. 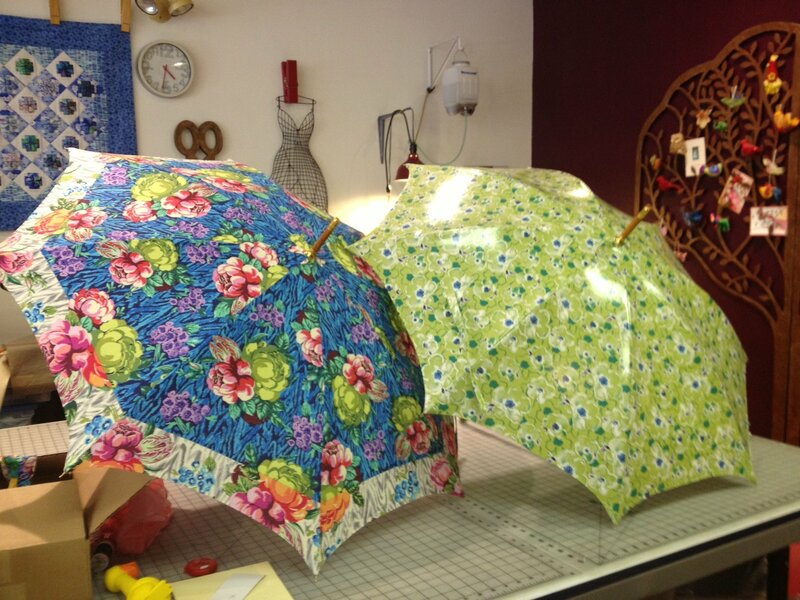 Umbrellas! I made both and have the kits and patterns available. 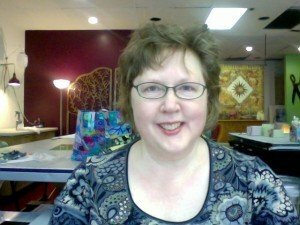 Sherry copied the image of the painting, her friend made, onto fabric. 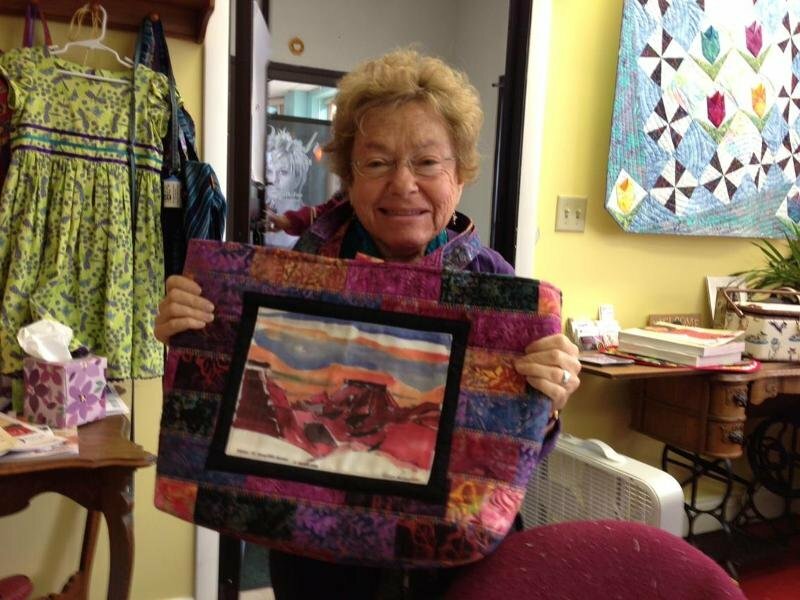 Then she made a bag in colors that complement to the painting and included the painting in a panel on the side of the bag. 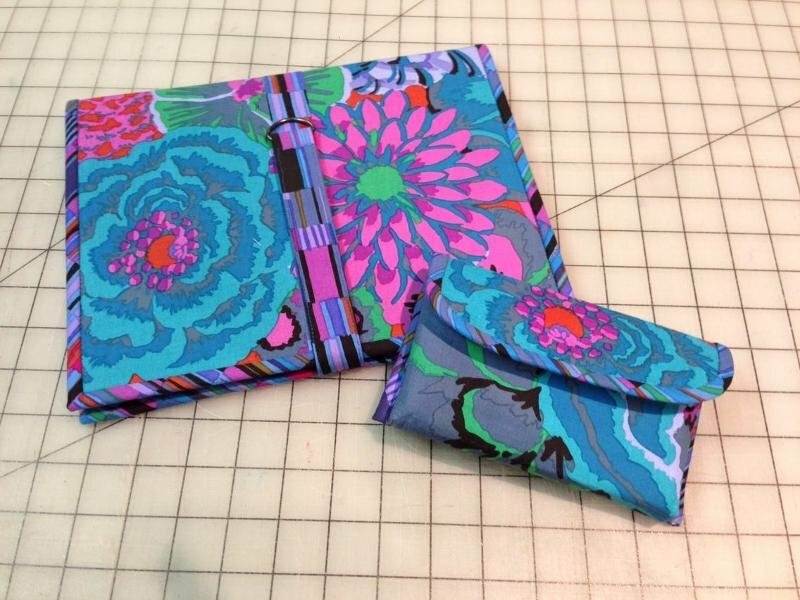 And iPad cover and a GPS case that I designed and made. 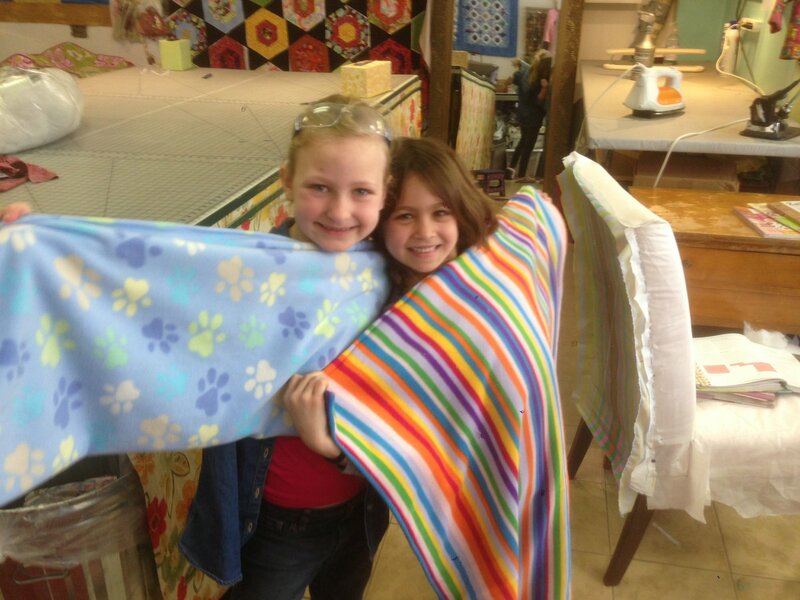 The girls both made blankets in a class together. 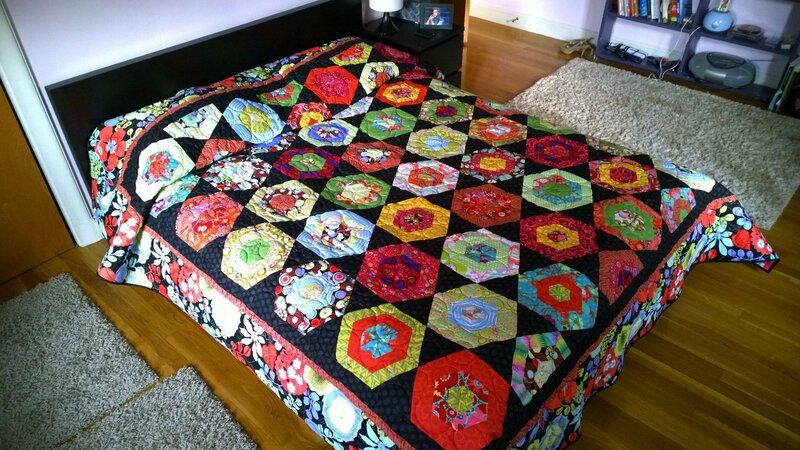 This is a quilt I made for my friend's daughter. 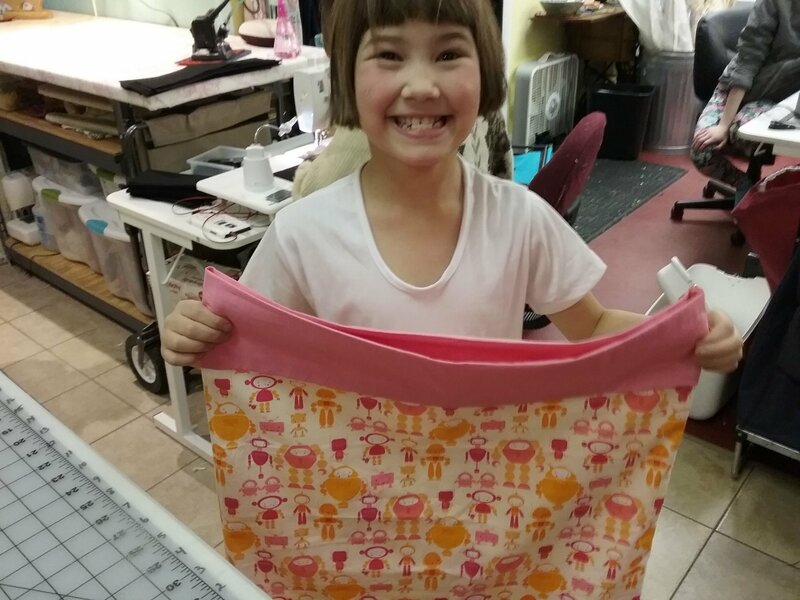 This is a bag that I helped the student design and make. 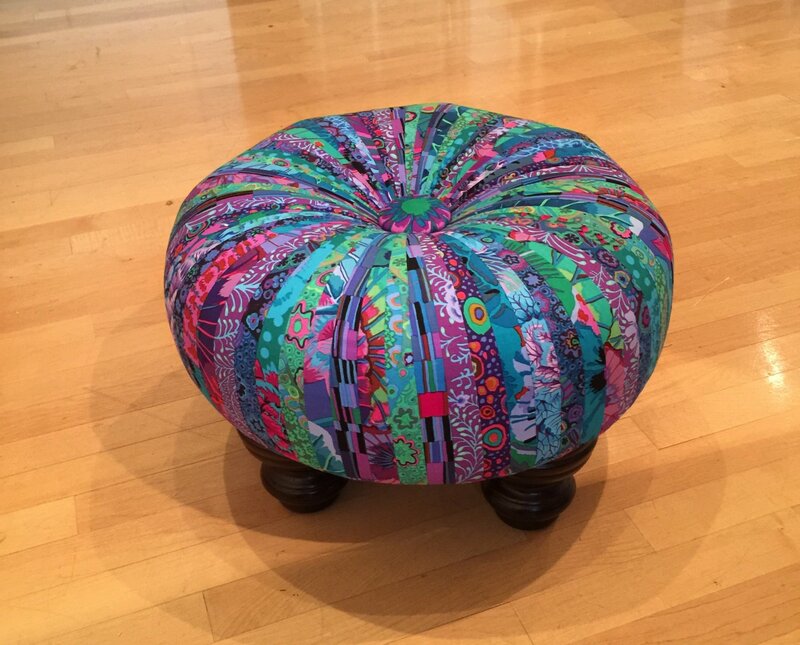 This lovely tuffet is made out of 64 strips of fabric. It's a beautiful project and it's fun to make. Shelley had a quilt that was falling apart. 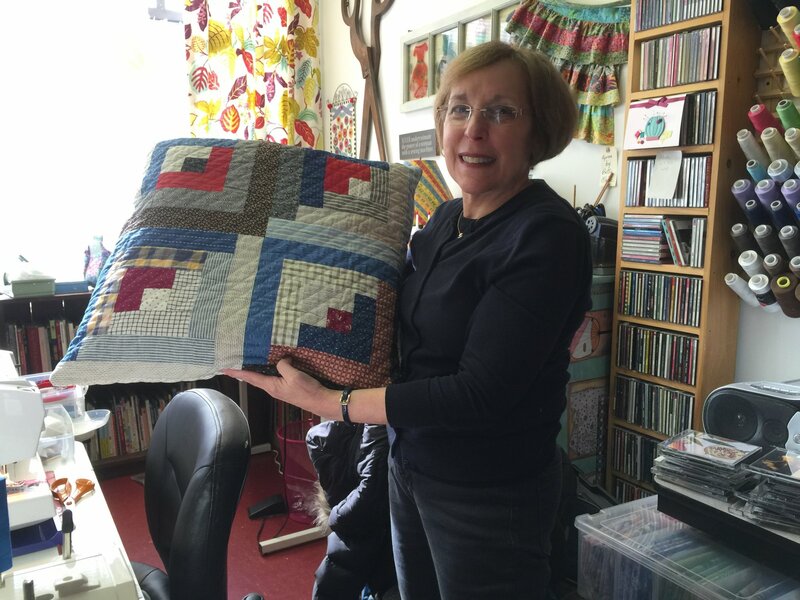 She decided to cut it and make two pillows out of the parts of the quilt that were still in good condition. One of my favorite students, Betty. 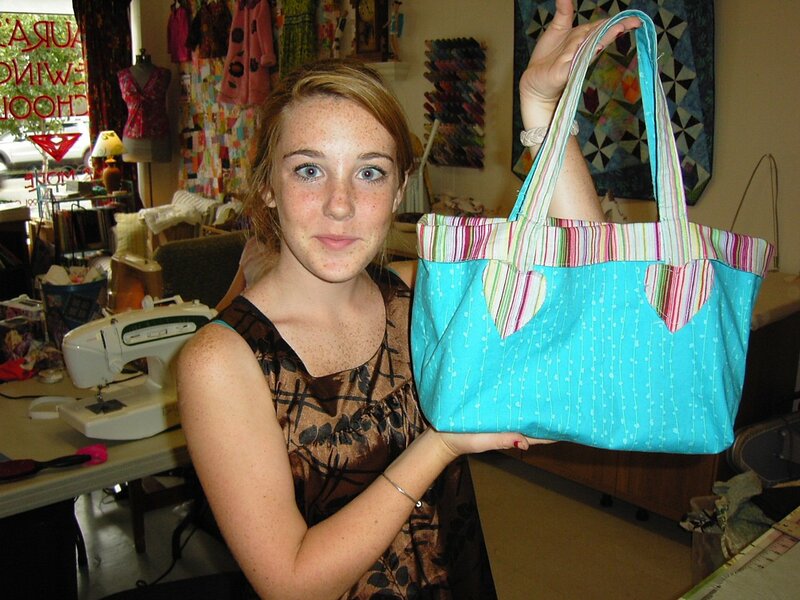 I taught her how to sew and knew her for at least 6 years. 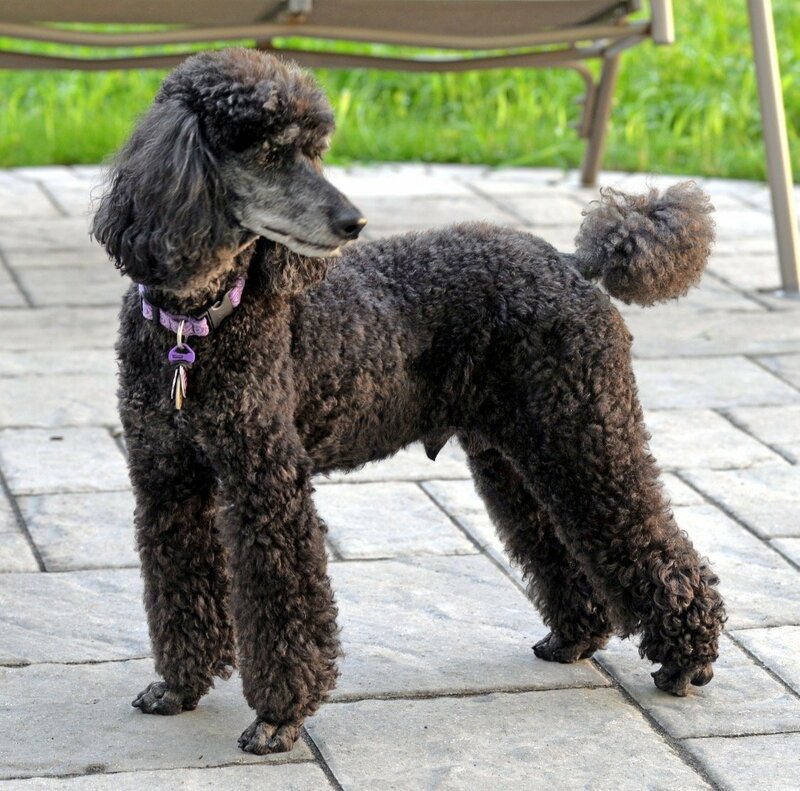 Unfortunately, she passed away in 2015. 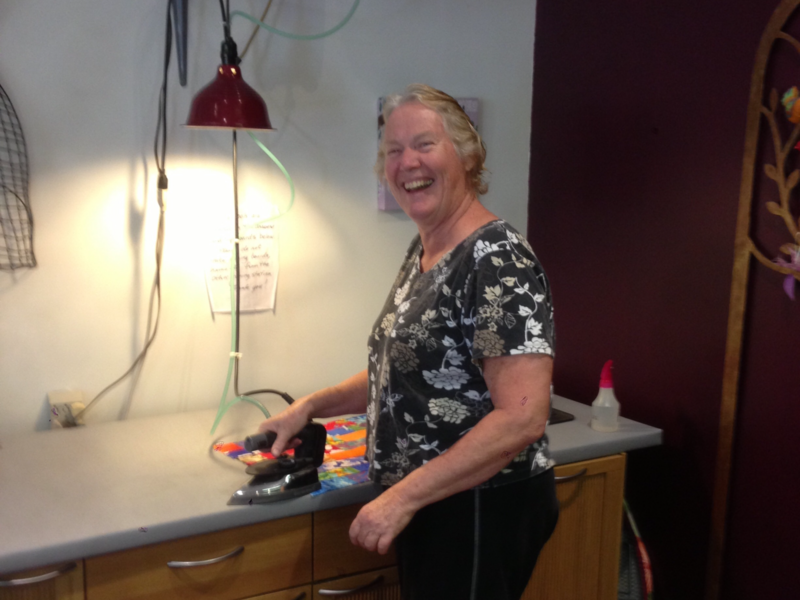 Susi is making buttonholes in her camp shirt. 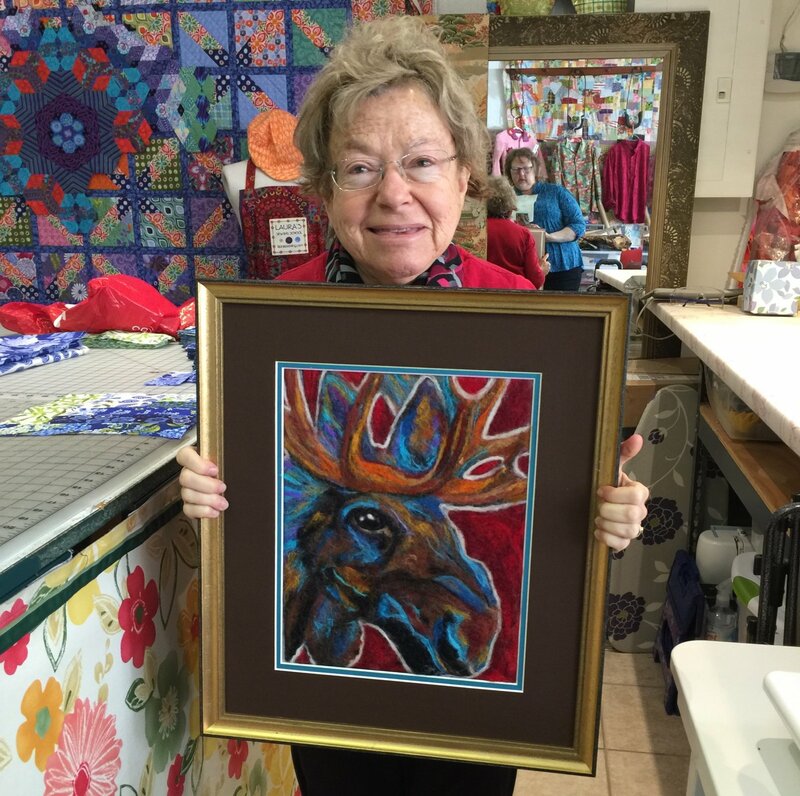 Sherry found an art print in Maine, and she was inspired to re-create it out of wool and needle felting. 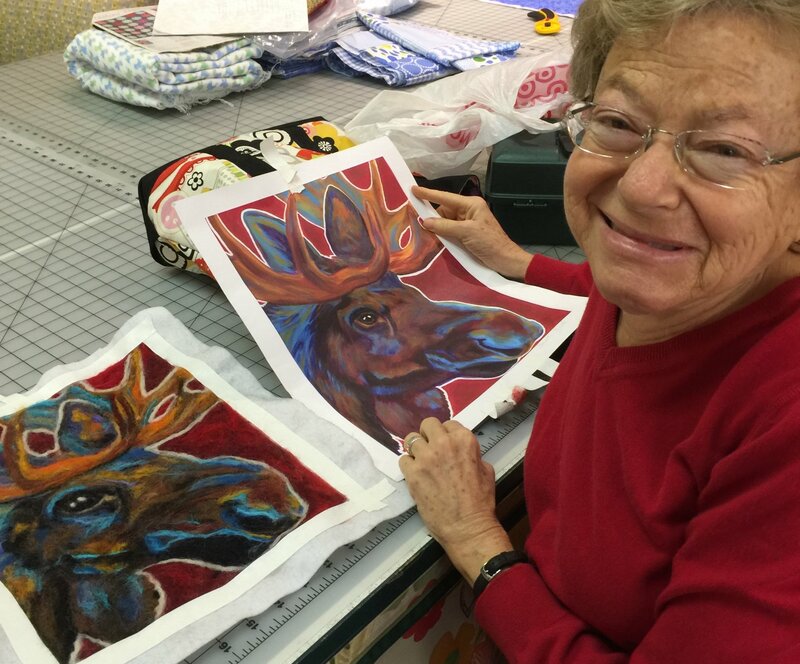 Here is a photo of Sherry with both her work and the print that inspired it . 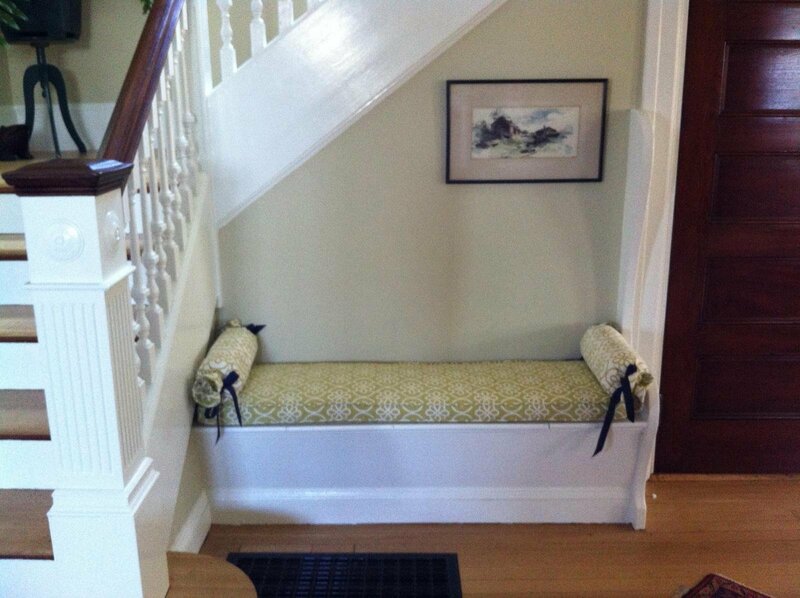 While Norma is not in this picture, she made this bench cushion and the bolster pillows at each end. 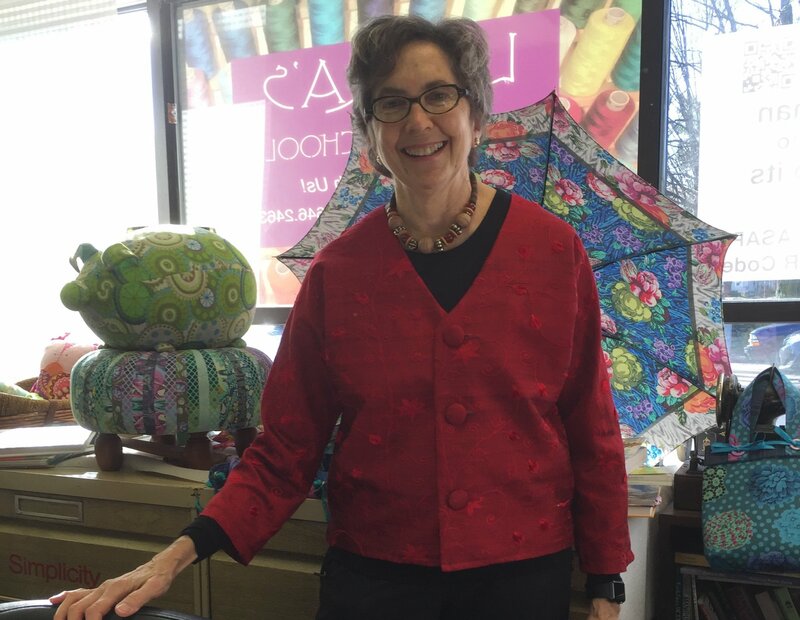 Ruth made this jacket out of silk dupioni. The buttons are made out of the same fabric. 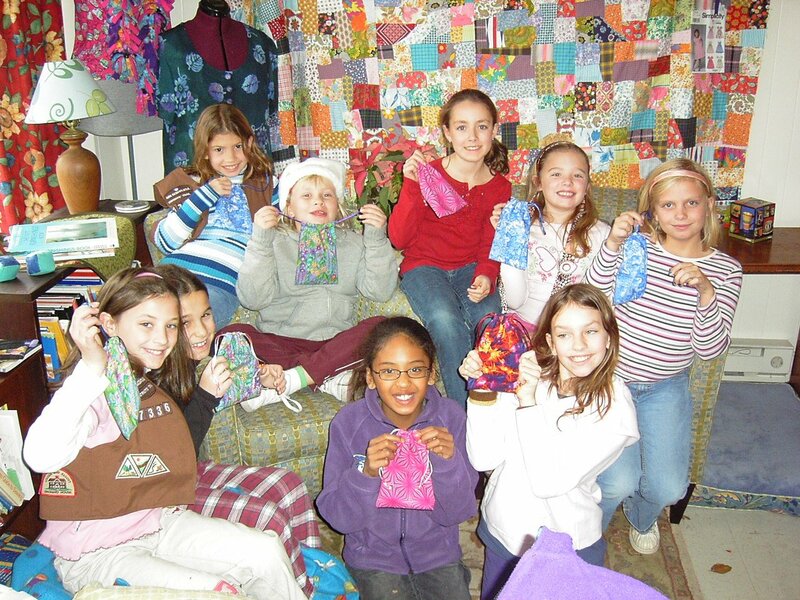 A local Brownie troop came and made some little drawstring pouches. Sherry is always good for fabric art. 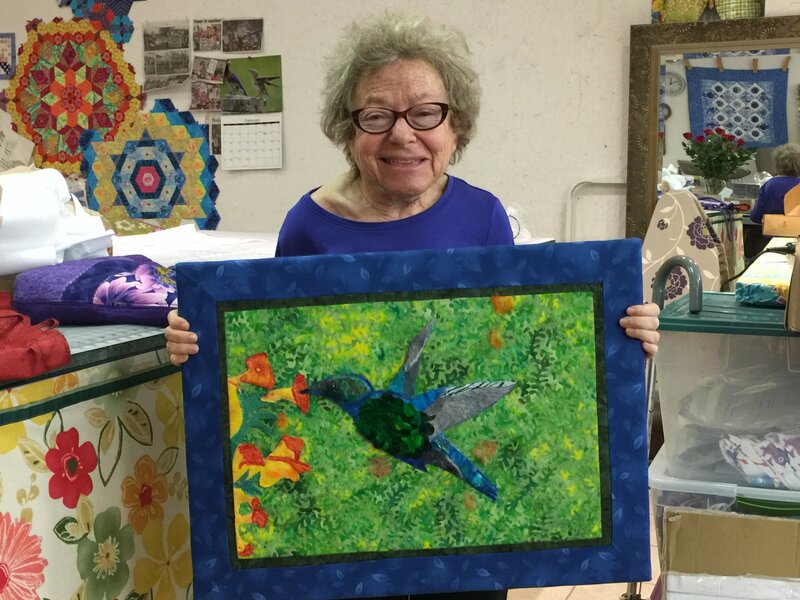 She did a fiber version of a photograph in which she captured a hummingbird in flight. 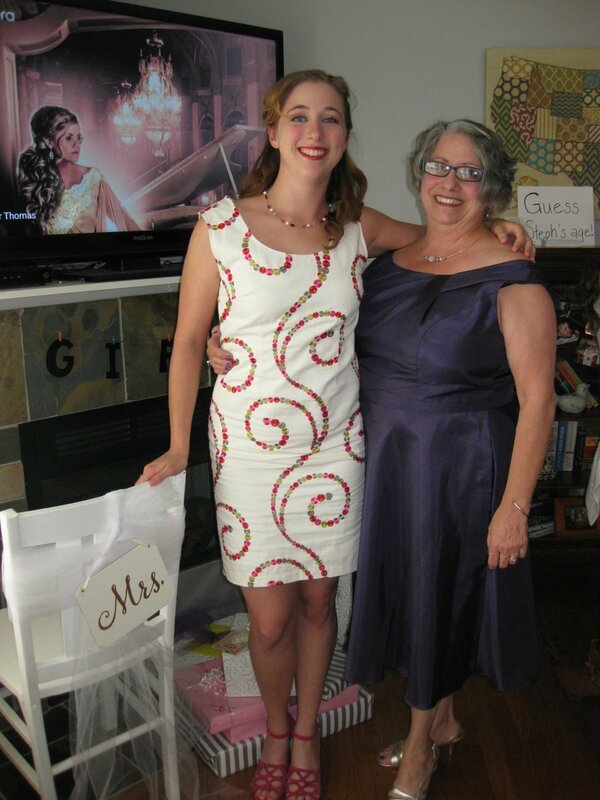 Jeanette (on right) and her daughter, Stephanie. Steph is wearing a lovely dress that Jeanette made from a home dec fabric. Alex is 9. 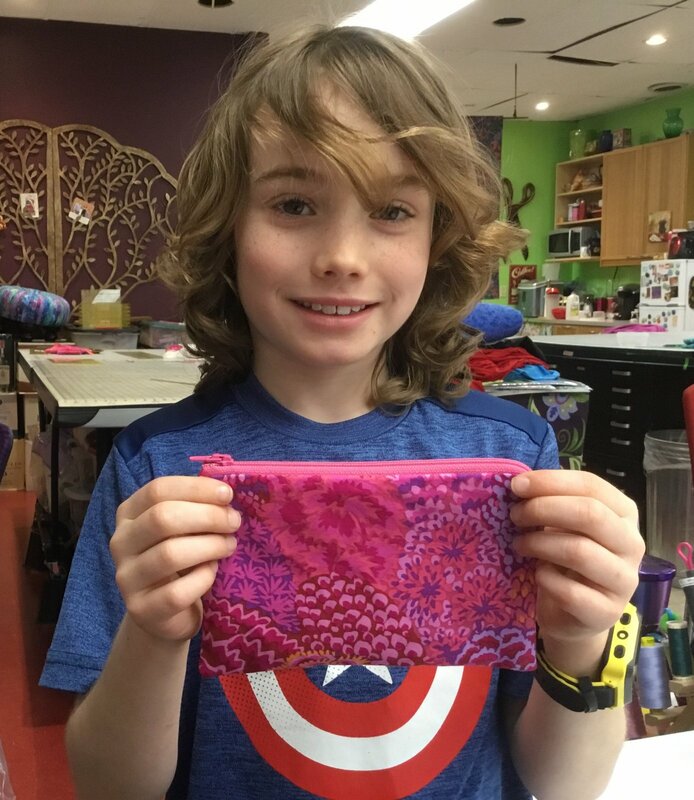 He made this zippered pouch for his mother, for her birthday. He's been sewing for 6 months and has made even harder projects than this. His second project was plaid PJ pants. 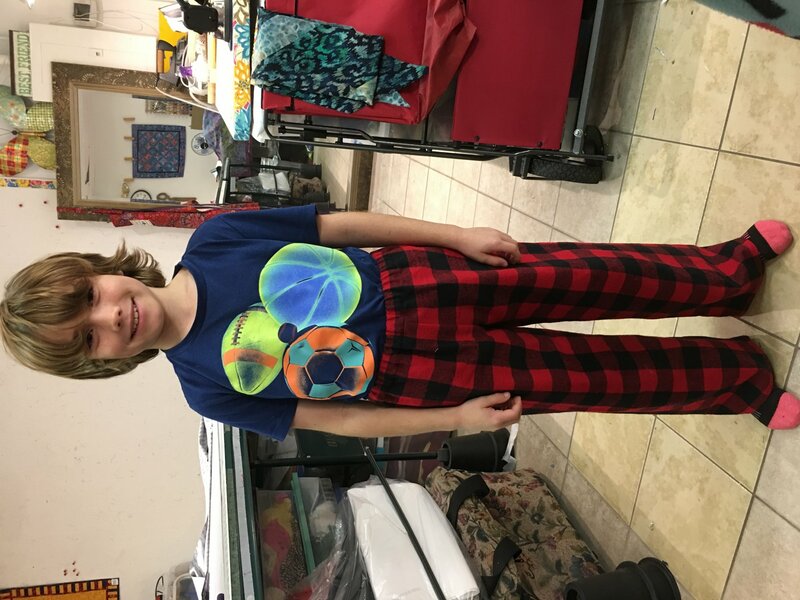 Alex made these plaid PJ pants as his second project. I showed him how to match the patter at the front and back seams, as well as the inside leg seams. He's got talent and patience. 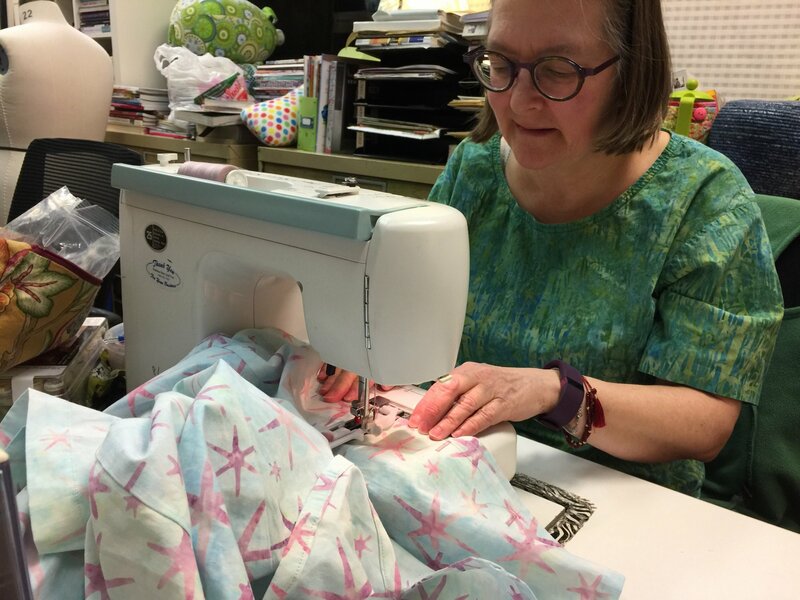 Our Fall 2018 Session of Sewing Classes will begin the week of September 8-14. Registration is now open. See Days/Times on the Registration form. Space is limited to 5 students per class. Your payment secures your spot in class. Come say "hello" at Arlington Town Day. We will have a booth and offer a Free Make-n-Take project! Mass Ave will be closed for this event, from Pleasant St to Mill St. Please sign up for our email newsletter to get up to date information. We value your privacy and do not share your information with anyone. And, each newsletter contains an unsubscribe link.